Historic shapes and colours meet modern design. 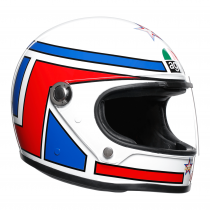 The Legends helmets immortalise riders and achievements that will always be remembered. All the elements of a good quality helmet including comfort, ventilation and most importantly, protection meet to the highest standard. 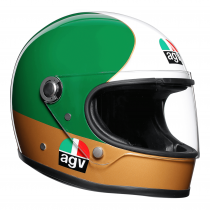 The X3000 carries the signature of AGV legend Giacomo Agostini. this model also includes a contoured chin piece enabling you to lean right up to the fuel tank along with features such as the dual button visor which can be opened with just one hand. Beyond his talent, over his world titles, more than his spectacular races. An athlete becomes history because of the passin hi infuses in others, the emotions he can give, his eternal winning attitude. 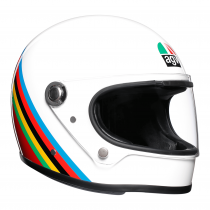 We celebrate the unrepeatable Barry Sheene 2with this unique helmet. The lucky number 7, the inseperable Donald Duck, his very signature on the back. The legend lives on. Second only to Ago, but really second to none. 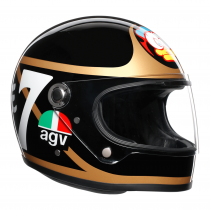 the legend of the 12+1 times world champion Angel Nieto relives in his AGV X3000. Clean simple lines, classic black and white livery, an amazing design to celebrate an inspiration, on and off the track. A special helmet, for unforgettable feats. With 15 titles, Giacomo Agostini stands out from the rest. Just like his race livery. The graphics of the Gloria replicate the design of his unique race suit. The five colours of the Olympic rings separating white from red. You need to do something special to deserve a very special nickname. 'Mad Horse' Marco Lucchinelli hasn't been the most winning racer, but surely one of the most memorable on the bike. Passion, courage, unpredictability. Becoming a legend is a success that has to do with inspiring the others. 'Lucky' keeps doing it. Timeless elegance, simple and geometric lines, exquisite shaes. 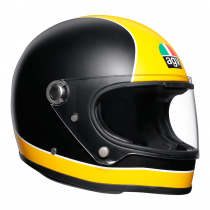 The X3000 Superba is inspired by historical AGV graphics. Refined for legendary rides. 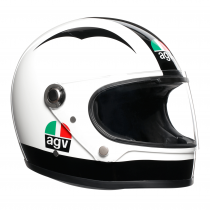 The AGV Mono is designed for the classic motorcycle riders out there. 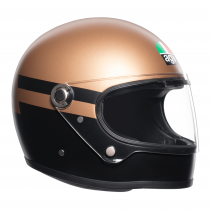 This classic style motorcycle helmet is bringing that vintage look back for the modern rider. 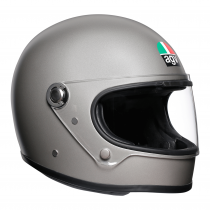 Different colours available and will go with any style of motorcycle road rider out there.